What Do Braces Feel Like? All braces take some getting used to. The good news: While they may feel odd at first, you’ll get used to your braces over time. Plus, for a minor annoyance, you’ll end up with a gorgeous, straight smile when you’re done with your orthodontic treatment. There will be some discomfort. The first several days of wearing braces will be the most uncomfortable for wearing adult braces or youth braces. Your teeth will feel achy as the alignment process begins and you may feel steady pressure from the wires, but that’s also the exciting part! Your teeth start to straighten out from day one. The pain is not severe, but it can certainly be annoying and disruptive. Rinsing with warm salt water and sticking to soft foods at the start can help. An over-the-counter pain reliever may also be recommended. You may develop unwanted side effects. 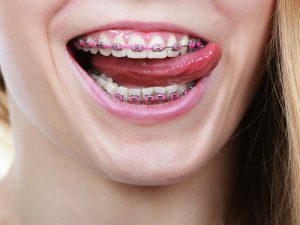 Some patients with braces develop mouth sores as they adjust to the hardware. This is normal – after all, there are brackets and wires on your teeth and they’re rubbing against sensitive gums, cheeks, and lips. Your Center City orthodontist will provide orthodontic wax that you can apply over the metal in the area that is bothering you to act as a protective barrier. He or she may have other suggestions for numbing the area and counteracting the pain. Discomfort will come and go. Just when you think you’re starting to get used to your braces, another orthodontic appointment will be on the calendar. These visits include adjustments to move your teeth in the proper ways. Your orthodontist may bend your arch wires differently or exchange light wires for heavier ones. The elastic rubber bands are changed out and – this is the fun part for many patients – replaced with the color of your choice. These adjustments may bump up the discomfort level for a few days following the appointment, but you will get used to your braces again. Typically, after a few months or so, even the adjustments will become routine and the aching will barely register. Not everyone experiences braces the same way. For patients who are not thrilled about their orthodontic treatment, braces can feel like an unwanted sentence. Any discomfort they experience can be intensified by their reluctance. Patients who are excited about their braces, however, have a more optimistic viewpoint. They know the braces won’t feel natural, but it’s all good. The end is worth the means. A little suffering is a small price to pay. They happily fit into all the clichés for the promise of a straight smile. Braces are a foreign object. Conventional braces live permanently on your teeth for months and sometimes years. And even though Invisalign braces are removable, the aligners are appliances that aren’t normally on your teeth. The most important thing to remember is that braces not only straighten your teeth, they make your mouth healthier. Teeth that are straight are easier to clean and that means fewer cavities. Aligned teeth mean less likelihood of jaw problems, like grinding and clenching. And, of course, straight teeth make you look better. Schedule a consultation at Roberts & de Marsche, the orthodontic practice serving Center City, Philadelphia and Lawrenceville, NJ, to ask all your questions about what braces feel like and more.